The Stonehaven architect John Ellis designed the World War One and Two War Memorial that proudly stands on Black Hill, Stonehaven. It is unique in that it can be seen from most parts of Stonehaven and its surrounding areas, providing a permanent and daily reminder to local people of the supreme sacrifice of servicemen from Stonehaven. As the photograph on the left shows it looks like an incomplete round temple - and was intentioned design as such to be a reminder of the loss of life and incompleteness of a full life of those who died in the Wars. An inscription carved into the stone at the top of the temple is written: "One by one death challenged them, they smiled in his grim visage and refused to be dismayed". Lower down on the lintels are carved the names of World War One Battles - Gallipoli, Jutland, Marne, Mons, Somne, Vimy, Ypres and Zeebrugge. Some of the Second World War Battles were later added. The names of the dead from the First World War were inscribed in the central column and those who gave their lives in the Second World War were engraved around the sides. The monument was one of the last to be erected in Scotland after the First World War. Another location discussed was the Market Square within the town centre. The Black Hill land where the monument now stands was donated by then land owner Lady Cowdray. Fundraising for building the monument was organised by locals through private donations, fetes, dances and whist drives. The monument was unveiled at 3pm on Sunday the 20th May 1923 during a dedication ceremony. Directions on how to get to the monument can be found on the Dunnottar Castle page. There is free parking near to the monument. Getting there does involve a walk up a steep stony hill. There are plenty of seats around the monument and it's a great place for a peaceful picnic. The views across the harbour, surrounding hills, the Castle and the town are worth the walk. 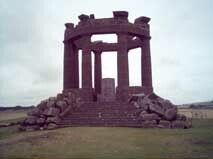 For more monuments in Aberdeenshire click here. John Ellis was registered under the Aberdeen Chapter of the RIAS which at that time covered a sizable area of the North East of Scotland. He lived and practiced in Stonehaven with stints in South Africa in the 1900s until his early death in 1929. His own rather fine house still stands in the town along with other interesting buildings he completed. It is interesting that he is held in high regard in South Africa today with some fine buildings, one only recently restored to its former glory 106 years on.